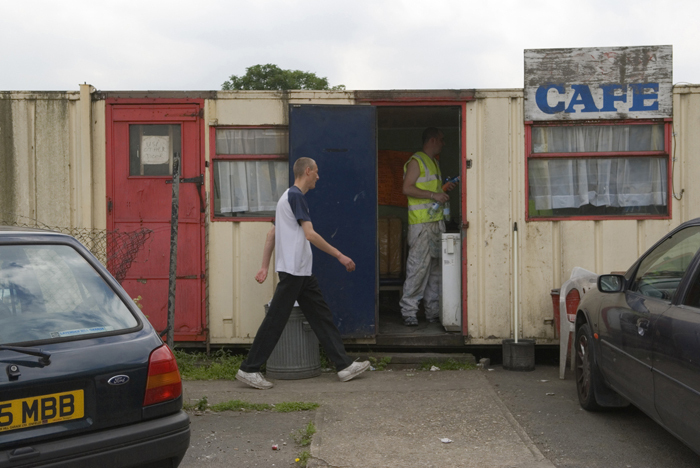 Transport cafe, Hackney Marshes. © Homer Sykes 2006. Burning Geronimo through the East End, the motor skittish at jump, stop, start. Music blasting out the windows, slapping Joe Public in the face as we roar by. Tossing the used notes behind us, dirty knees and carpet burn noses. Each staccato burst spent, surly, and spittin’ in the eye of every pocket money massive. every green a pistol shot. The silence: single mum heavy. Someone drops the sprog.